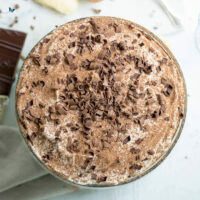 Tiramisu Trifle Recipe: I am a contributor to Amanda’s Cookin’ and this recipe first appeared on there as Tiramisu Trifle. 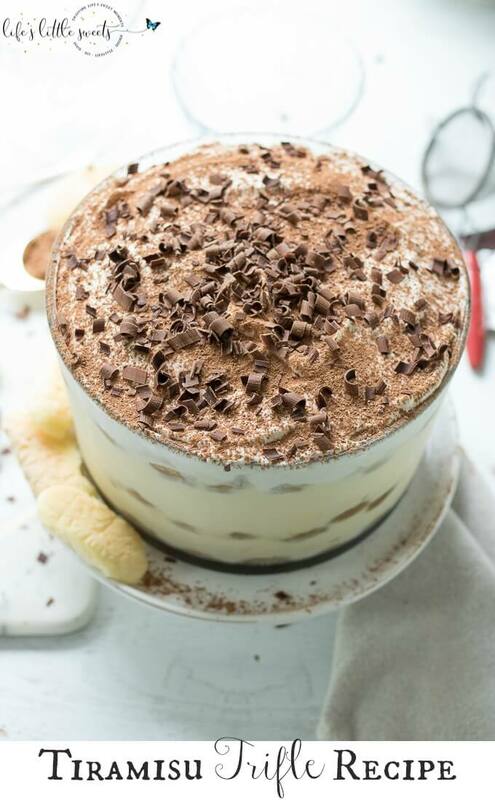 This Tiramisu Trifle has delicate ladyfinger sponge cakes soaked in an espresso-rum mixture, layered with a rich Mascarpone-whipped cream mixture and topped with vanilla whipped cream, cocoa powder and semi sweet chocolate curls. 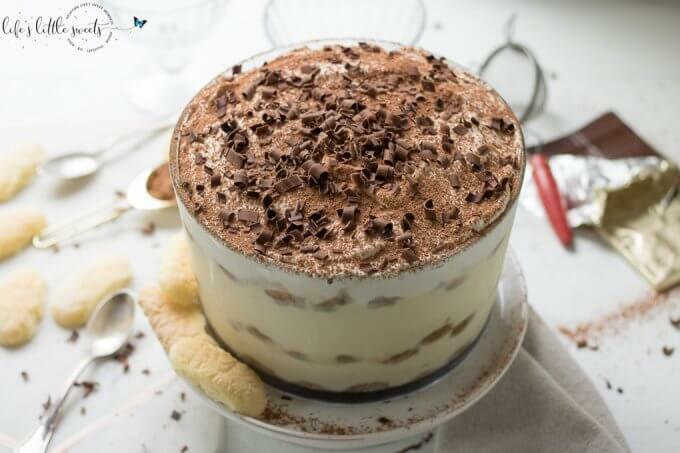 A dessert at the top of many people’s favorite dessert list, this homemade tiramisu trifle will impress anyone who is lucky enough to have a taste! 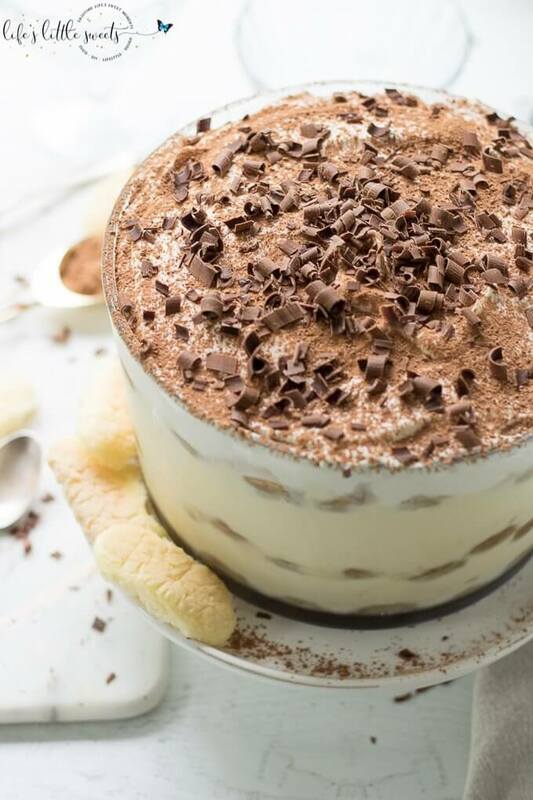 Hi Everyone, Tiramisu is one of my favorite desserts, hands down. Whenever I make it, I treasure every bite. 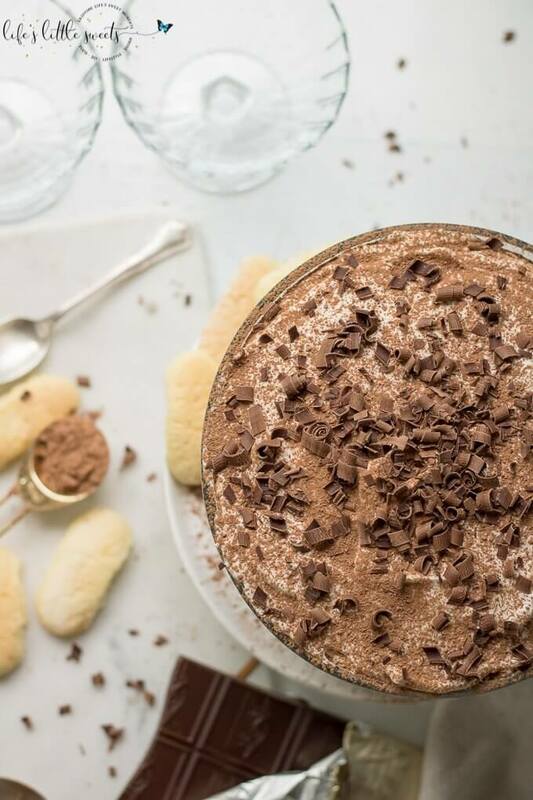 It happens to be one of many other people’s favorite desserts too, so that’s why it’s wonderful to know a tried and true tiramisu recipe so that you can make it when the tiramisu craving comes! Remember my Tiramisu in Mason Jars recipe? This version is in a large trifle glass container and has semi sweet chocolate curls on top. This presentation makes for a showstopping dessert presentation for any gathering. 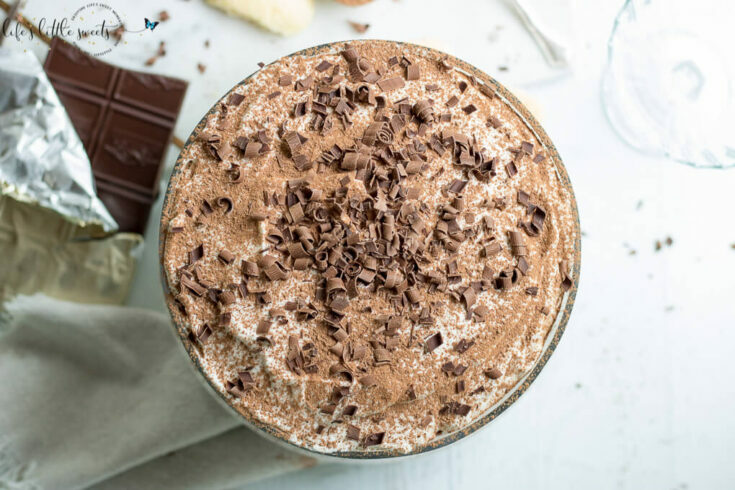 Tiramisu is one of those desserts that seems difficult to do but if you prepare ahead and break the steps down, making this dessert is entirely doable for anyone, even a busy mom of two kids under 5 like me! 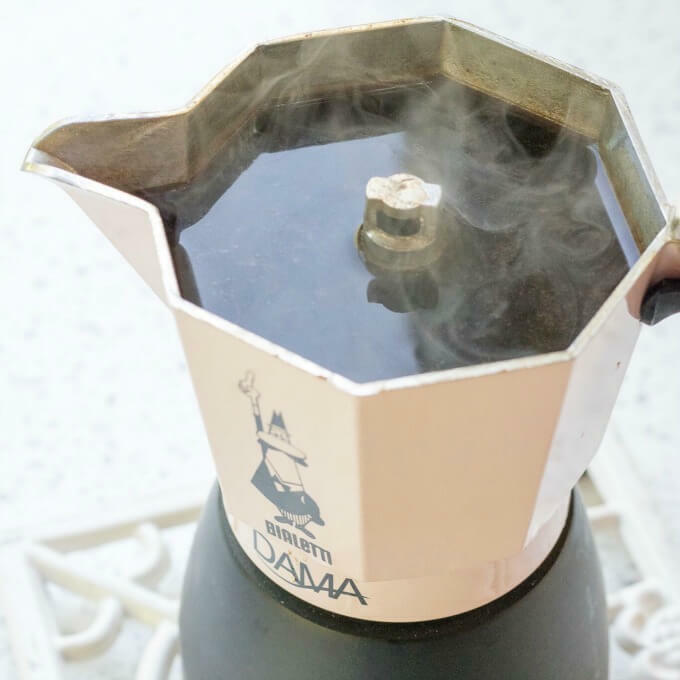 make the chilled espresso ahead of time (I use a stove top espresso maker), I always do it the day before and have it completely chilled before using it. 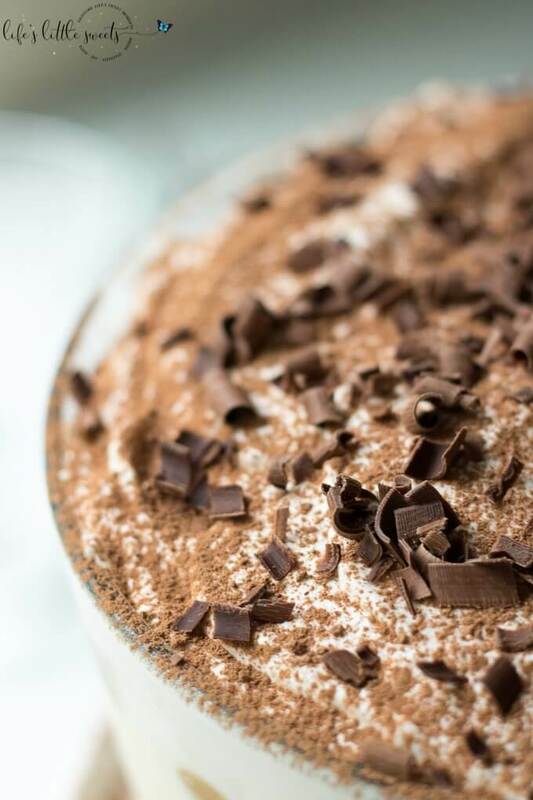 make sure the whipped cream, in both the tiramisu cream layer and the topping layer is completely whipped, I highly suggest using the cream of tartar to help stabilize it. 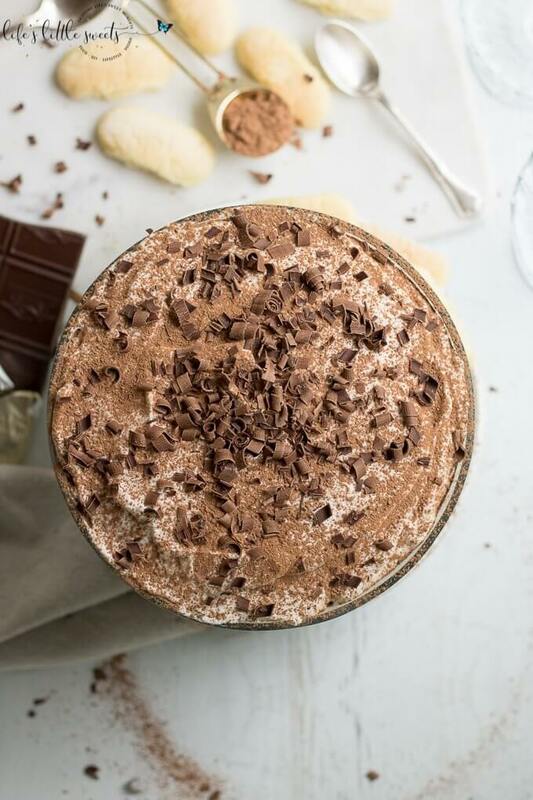 before making the whipped cream for both the tiramisu cream and topping layers, chill (preferably metal) round mixing bowl for 5-10 minutes in the freezer, whipped cream whips better when it’s very cold. assemble the dessert the day before or at least 8 hours before serving to give it enough time to chill completely through, especially since this is a large serving container. Having the dessert served really cold is essential. 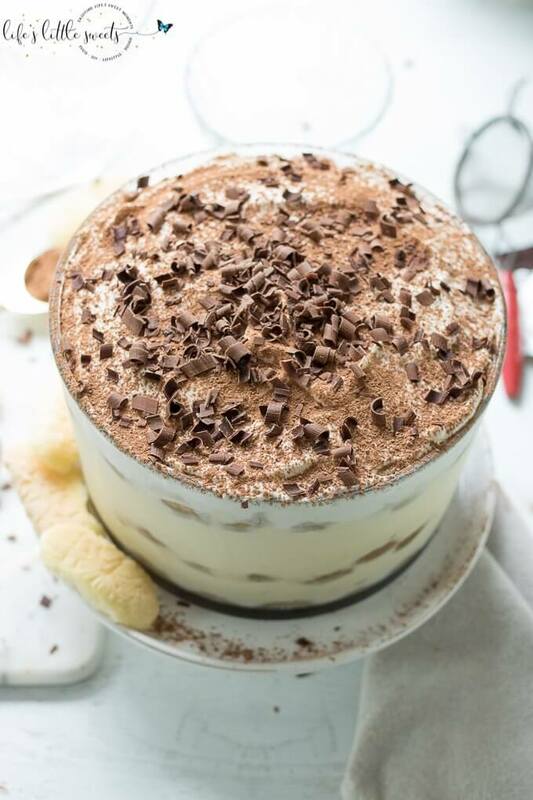 I know you will love this Tiramisu Trifle, let me know what occasion you make it for in the comments below! 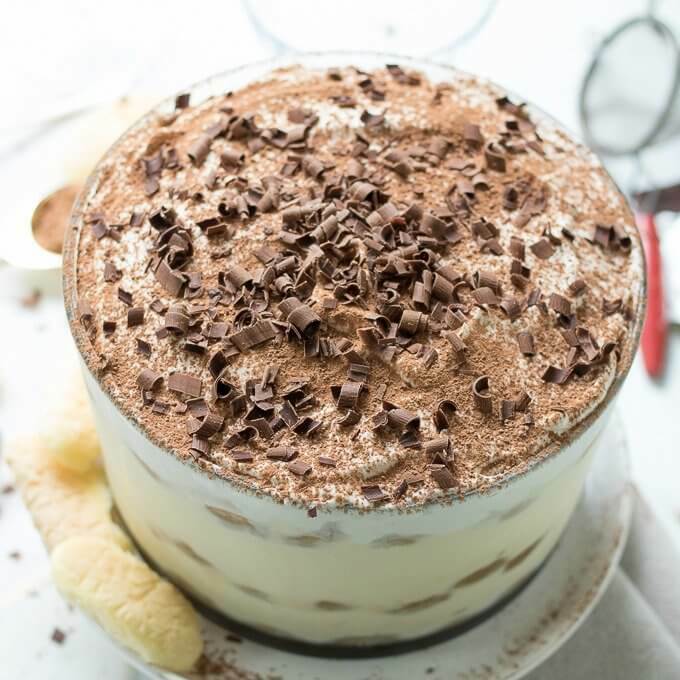 If you like this Tiramisu Trifle recipe, you might also like Mason Jar Tiramisu Trifle, Strawberry Mint Shortcake with Ladyfingers, and Mixed Summer Berry Trifle. Brew the espresso ahead of time, at least 1 hour and have completely chilled before assembling the tiramisu. Add in the dark rum and stir to combine when chilled. Using a handheld electric mixer on low, make whipping cream by combining 1-3/4 cups whipping cream, whip until bubbles form, then add 1/8 cream of tartar, and 1 Tsp. vanilla extract. Whip until stiff peaks form. A trick to seeing if it's done whipping: when you start to turn the bowl of whipped cream upside down, it should not slide down the bowl, it should stay stuck in the bowl. Bring a pot of water to boil either in a double boiler or just a metal bowl over a medium pan of water (use baking mitts!) add 1 cup sugar and 6 egg yolks. Reduce to simmer and stir continuously for 10 minutes. Remove from heat. Using a hand-held electric mixer, on medium-high, whip the yolk-sugar mixture until light "lemon" colored. Add the Mascarpone cheese to the yolk-sugar mixture until combined. 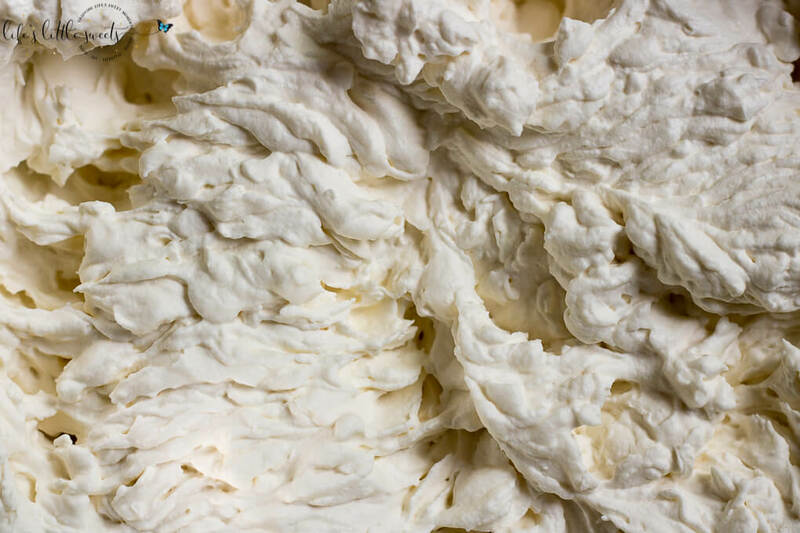 Add prepared whipped cream mixture by gently folding in with a baking spatula until there are no streaks. Cover and place in the refrigerator to chill until you are ready to assemble the tiramisu. In a chilled medium-size metal mixing bowl, add whipping cream, beat on low with the mixer until bubbles form, add the 1/8 cream of tartar, 1 tsp. vanilla extract, 2 tablespoons confectioner's sugar and beat on high until fully whipped (until stiff peaks form). Chill until ready to top as the last layer of the tiramisu. 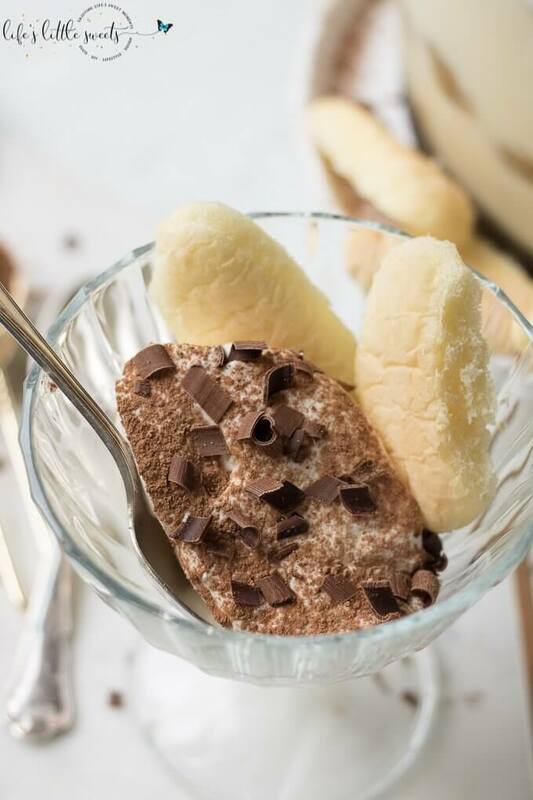 Assemble the tiramisu by adding the chilled espresso into a low dish. Quickly soak the lady fingers just a couple seconds and place into the trifle container. 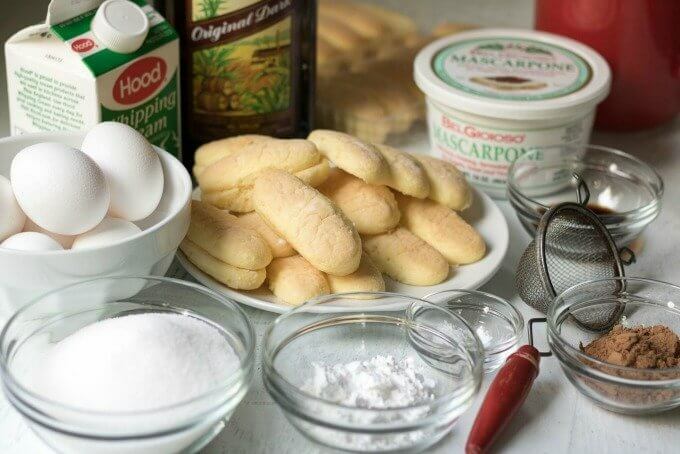 Arrange in a single layer (about 12-14 lady fingers for a 13 inch wide trifle container). 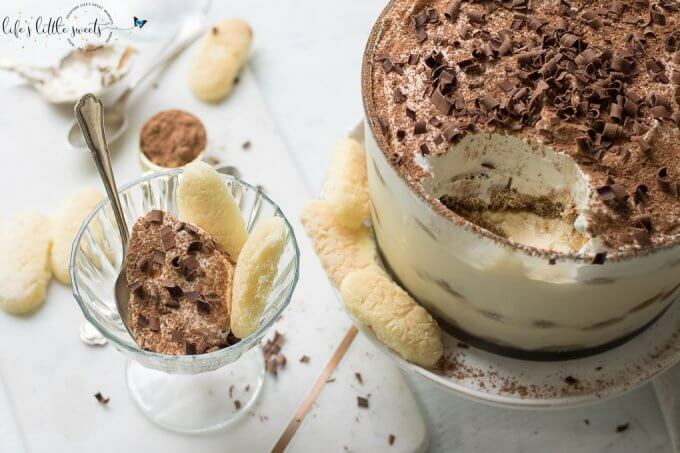 Add 1/2 the tiramisu cream layer and spread evenly or gently shake the trifle container so it can self-level. Make your 2nd layer of espresso-soaked ladyfingers in a single layer. Add the remaining tiramisu cream and level it. Add a 3rd and final single espresso-soaked lady fingers. Add the whipped cream topping. Cover carefully and chill for 8 hours or overnight before serving. Before serving, dust the top with unsweetened cocoa. Add semi-sweet chocolate curls. Enjoy! before making the whipped cream for both the tiramisu cream and topping layers, chill (preferably metal) round mixing bowl for 5-10 minutes in the freezer, whipped cream whips better when it's very cold.